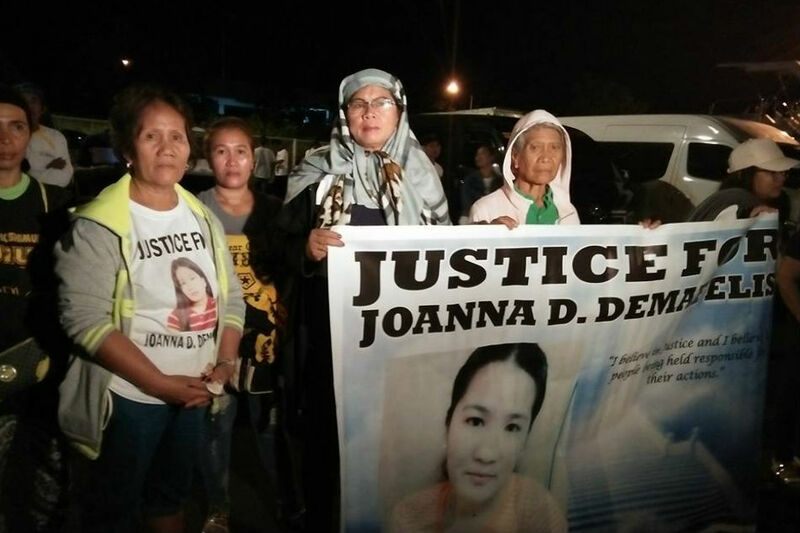 The remains of the Filipina domestic helper found in a freezer at an abandoned apartment in Kuwait arrived in Iloilo early Saturday, as her grieving family and community called for justice. It was a tragic homecoming for Joanna Demafelis, who left the Philippines in 2014 to work in the Gulf state. She had been missing since September 2016 and was found earlier this month. Some 200 people, including family and friends, waited for her arrival at the Iloilo International Airport. They wore white T-shirts and brought tarpaulins with Demafelis' picture, seeking justice for the murdered Ilongga. The wooden casket bearing her corpse were to be brought to her hometown in Sara. The local government of Sara on Tuesday passed a resolution that condemned the gruesome murder. Demafelis was found inside a freezer at an abandoned apartment earlier this month, with initial investigation revealing she died of internal bleeding. Her body bore bruises and a broken hipbone. Demafelis' slay, one in a string of deaths of Filipino migrants in Kuwait, angered President Rodrigo Duterte, who has hit the Kuwaiti government for failing to protect Philippine workers there. The government has enforced a deployment ban to the Gulf state and encouraged Filipinos there to come home, ruffling ties with Kuwait.